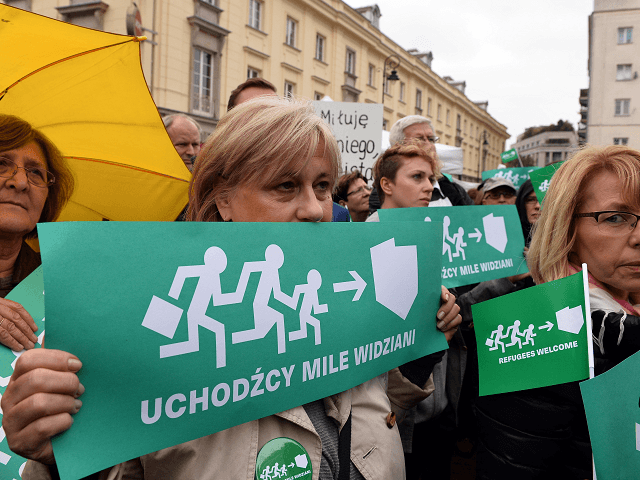 Already unpopular in conservative, Catholic Poland, a new poll shows attitudes towards non-European migrants hardening in the country with a convincing majority saying they should not be allowed into the nation. Some 74 per cent of Poles are against their homeland accepting migrants from Africa and the Middle East according to the research, which comes as continued pressure from the European Union to accept migrants has caused tensions between Brussels and Warsaw. Just 20 per cent of Polish respondents to the research were in favour of taking in foreigners from Africa and the Middle East, reports Radio Poland, while the remaining five per cent hadn’t formed an opinion at all. Breitbart London reported in January when this survey was last conducted, which found two-thirds of Poles then opposed taking these migrants into the country. The uptick in opposition indicates that despite the threat of sanctions from the European Union on Poland, which is a net recipient of benefits from the political bloc, normal Poles are determined to not change their stance. The European Union told Poland, and equally opposed Hungary that they could expect to be the subject of legal action by the continental political bloc if they didn’t open their borders to the thousands of migrants who have travelled to Southern European nations like Italy and Greece in the hope of continuing north to wealthy, high-benefits nations like Germany and Sweden. The United Nations has already called on the European Union to punish Poland for their resistance to mass migration. Poland itself has pushed back against the aggressive posturing of the Union, with foreign minister Witold Waszczykowski saying there was no reason to link his nation’s refusal to accept migrants with the payments of structural development funds paid to European nations by the Union. Despite Poland’s apparent determination to refuse non-European migrants, the research continued to show Poles willing to accept refugees from war-torn Ukraine, with more than half of Poles willing to accept their European neighbours. Poland has already taken over 1.2 million Ukrainians, according to government figures.